Friends Meeting House, Euston, NW1 2BJ. Nina Franklin, NUT National President. On June 30, hundreds of thousands of teachers, lecturers and civil servants took bold action to defend our pensions against Con-Dem cuts. Our action was a magnificent show of strength - but we all knew that one-day's strike would not be enough on its own to win. That's why the NUT and other unions are preparing for further action this November - but, this time, we want even more unions to be taking action alongside us. The TUC Congress - bringing together all of Britain's public and private-sector unions - is meeting in London from September 12 -14. That Congress needs to respond to the savage cuts to pensions, jobs and services by agreeing to co-ordinate the widest possible industrial action to force this Government to retreat. The TUC needs to take a fighting lead. 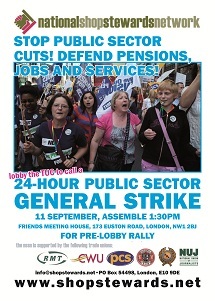 That will be the message from a Rally and Lobby being organised on Sunday September 11th by the National Shop Stewards Network, the network founded with the help of the RMT union in 2007 and now supported by other national unions. Sunday's Rally in Friends Meeting Hose, Euston, assembling at 1.30pm, will be just what is needed to galvanise teachers for the strike action we need to prepare later this term. Come along with your colleagues and listen to Bob Crow (General Secretary, RMT), Mark Serwotka (General Secretary, PCS), Nina Franklin (National President, NUT) - and join in the discussion and debate about how we can defeat these Con-Dem cuts.